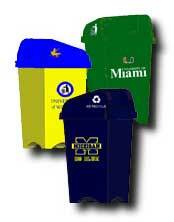 Our receptacles can employ custom colour coatings and your school or corporate logo or special event identity. Receptacle rentals are available for special events and festivals. Ecolad is a proud supporter of the National Association of College Auxiliary Services (NACAS). Ecolad Corp., 243 W. Congress, Suite 350, Detroit, MI 48226. Tel: 519-250-0366; Fax: 519-250-0160.